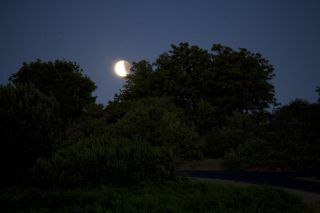 This photo of the partial lunar eclipse of June 26, 2010 was taken by skywatcher Scott Kardel from near the Palomar Observatory in California as the moon appeared low on the Earth's horizon before sunrise. A partial lunar eclipse that took a shadowy bite out ofthe nearly full moon early Saturday thrilled some skywatchers in North America whohappened to be in regions where the phenomenon was visible. During the partial lunar eclipse, the moon passed throughjust part of the Earth's shadow, so was only partially obscured for severalhours. The eclipse began at about 2:50 a.m. Pacific Daylight Time on Saturday andlasted several hours, but it was best visible to skywatchers in the western andcentral parts of North America ? giving them a cosmic reward for rising earlyon a weekend. Saturday's eclipse also occurred a few hours before the fullmoon of June and occurred low on the Earth's horizon, which was expected tomake the moon appear larger than normal because of the "moonillusion." Some scientists attribute the effect to the human mind'sattempt to make sense of the moon in relation to objects on the horizon. "I suddenly remembered the lunar eclipse and jumpedup to look out the window," Leach told SPACE.com in an e-mail. "As I pulledback the curtains, there was the moon sinking low in the western sky, andhalfway covered by the Earth's shadow!" At the lunar eclipse's peak, about 54 percent of the moonwas obscured. That maximum coverage was expected to occur at 4:38 a.m. PacificDaylight Time on Saturday, according to a NASA announcement. The partial lunareclipse was also expected to be visible from India, Japan and parts of EastAsia, though it occurred at sunset Saturday evening (local time) in thoseregions. In California, skywatcher Scott Kardel awoke early tocatch the eclipse at Palomar Observatory atop Palomar Mountain, where he servesas the public affairs coordinator. "Partial eclipses can be tricky," Kardel wrotein a blog post of his lunar eclipse observations. "To capture theillumination on the eclipsed portion of the moon you pretty much need to overexposethe rest." Like Leach, Kardel's partial lunar eclipse photos showthe moon low on the horizon, with a big bite missing. But Kardel got an extrabonus: The International Space Station. "Much earlier, just before the maximum eclipse wehad a pass of the International Space Station," Kardel wrote. "Fortunately,I was able to switch targets in time." In his long-exposure space station photo, the orbitinglaboratory appears as a streak of light passing just to the side of thebright planet Jupiter. In fact, the International Space Station was flying innear continuous sunlight over the weekend as it orbited the Earth at analtitude of about 220 miles (354 km). That meant the space station was visible,weather permitting, multiple times over some parts of North America, though thesolar line-up was expected to end today. Saturday's partial lunar eclipse is the first of twocosmic events involving the moon over the next few weeks. The moon will pass in front of the sun in a total solareclipse on July 11, though it will be visible only from parts of the SouthPacific Ocean. The next lunar eclipse will occur on Dec. 21 and will bea total lunar eclipse. That lunar eclipse, according to NASA officials, shouldbe visible to skywatchers across most of North America.